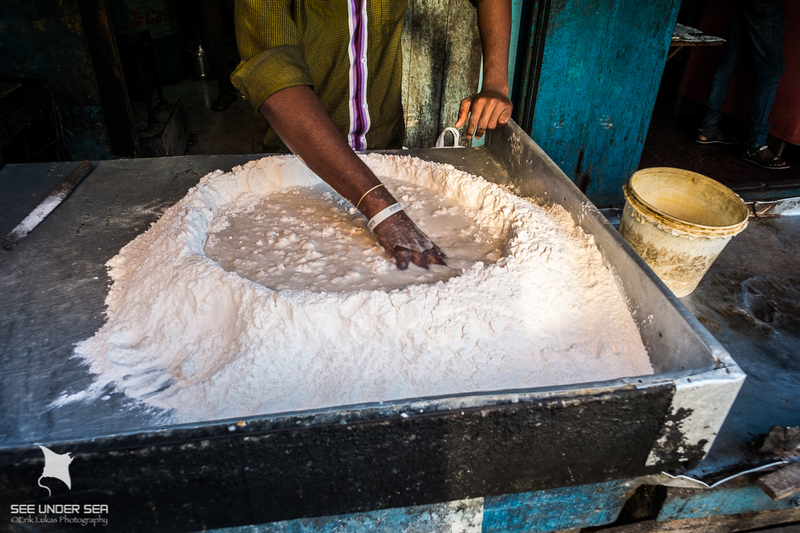 Located roughly 1000 miles east of mainland India, the 270 or so mostly uninhabited islands known as the Andamans are nothing if not remote. They are also home to some absolutely stunning underwater scenery, abundant fish life and unusual species, yet are relatively unknown amongst traveling divers. Just getting there is an adventure in itself, but as participants agreed, well worth the effort. Our first stop after arriving in the provincial capital of Port Blair was the Fortune Bay Resort, where we enjoyed old-world charm and captivating views, while anticipation built for our upcoming live-aboard adventure. The next day, we were welcomed aboard our floating home for the next 10 days, the sleek and luxurious motor vessel, Infiniti. Currently in her third year of operation, she is India’s first proper live-aboard, and we were their first-ever American charter and dedicated photo group. From the moment we stepped aboard, it was obvious that we were in good hands. The vessel itself inspires confidence at every turn, being robustly built and thoroughly equipped with a full compliment of safety gear, along with all the requisite creature comforts. Equally impressive was the all-Indian crew, each of whom demonstrated a thorough knowledge of their respective jobs, from the captain to the deckhands. They were also exceptionally cheerful, friendly and helpful, and clearly went out of their way to make sure everyone had the best possible experience. 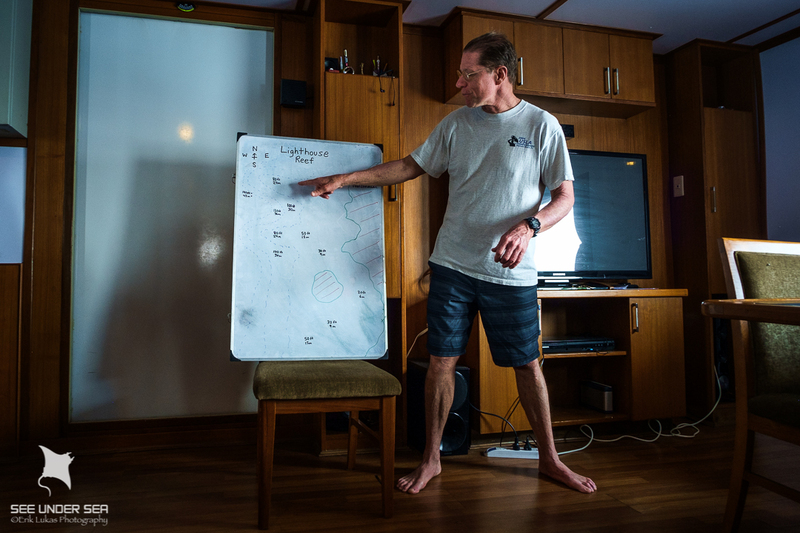 Dive leaders were also superb, providing excellent briefings as well as in-water guidance. Safety was always top priority, but the vibe was never overbearing. 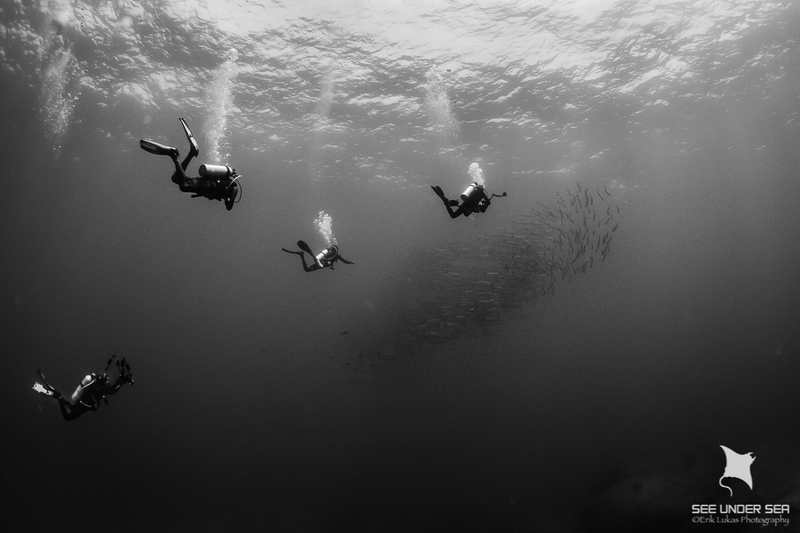 As experienced divers, we really appreciated being treated like adults, and allowed the freedom to dive our own profiles and spend as much time as we wanted with photo subjects. Dinghy drivers were consistently helpful and attentive, always keeping a close eye for surfacing divers… a very important consideration in current-prone, open waters. Late February in the Andamans is typically idyllic weather, but winds were unusually brisk the first few days, which somewhat limited our choice of dive sites. In spite of the choppy seas, however, we enjoyed good to great visibility and a wide variety of marine life at South Cinque Island, which is also exceptionally picturesque above the surface. While motoring to one of the sites, we passed sugar-white beaches, rocky bluffs and dense forest, finally to be greeted by a pair of deer peering at us from the bush. Back-rolling into clear blue water and descending a steep rocky slope, we immediately encountered a large marble ray, along with several Napoleon wrasse, while hefty dog-tooth tuna patrolled the mid-depths. A steady stream of blue and yellow fusiliers paraded past, as squadrons of bluefin trevally weaved among them. Closer to the bottom, a pair of strikingly patterned juvenile emperor angelfish cavorted about, while clouds of brilliantly colored Indian flame basslets hovered above green tubastraea coral trees. Towards the end of the dive, we watched as an endemic Andaman sweetlips glided among the rocks, until a curious hawksbill turtle diverted our attention. Other sites around North Cinque offered similar attractions, and provided plenty of photo ops during our first couple days. By day three the wind showed signs of abating, but still prevented us from diving the exposed sites we’d hoped for. So instead we headed north to one of Infiniti’s newly discovered sites, the wreck of an Indian minesweeper, the Chidia Tapu, which ironically fell victim to a mine in WWII. 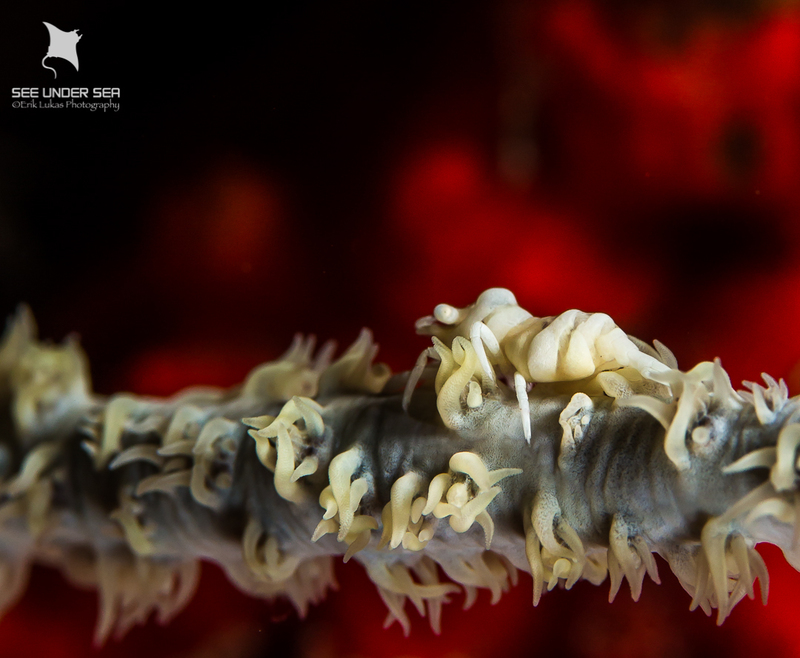 While visibility was somewhat limited, it proved to be a rewarding dive nonetheless, as well as an interesting photo backdrop. The rest of the day was spent exploring a rocky pinnacle followed by a shallow coral reef, both of which offered good macro opportunities. By the fourth day the wind finally dropped off, allowing us to dive some preferred sites near Havelock Island, including a rich and diverse inshore wall, where we encountered a wide spectrum of fish and invertebrate life, including the rarely seen yellow tilefish, endemic spinecheek anemonefish, and H. stricklandi nudibranchs, The remainder of the day was spent diving an open-sea site called Johnny’s Gorge, where we enjoyed excellent visibility and tremendous schooling fish action, starting with a large school of chevron barracuda in mid-water. Closer to the reef, which was adorned with large barrel sponges and soft corals, dozens of various species of sweetlips hovered in the gentle current, accompanied by hundreds of five-lined and lobetail snappers, along with several friendly batfish. Bluefin trevally and dog-tooth tuna made regular passes, and we even had a brief visit from a pod of bottlenose dolphins. Topping it off, on our last dive, the resident giant grouper, easily 5 feet long, sauntered up to check out several lucky divers. After motoring throughout the night, we awoke to a long-awaited sight—the unmistakable profile of the most remote of the Andamans, Narcondam Island. A long-dormant volcano blanketed by lush green forest, this seldom-visited island is surrounded by very deep water, and is a natural magnet for marine life. Our first dive was at HQ Pinnacle, a rocky shoal that tops out only 15 feet below the surface, making for a perfect multi-level dive. Winding our way among the peaks, valleys and canyons, we were greeted by a large school of bigeye trevally, as well as a parade of muscular dog-tooth tuna. 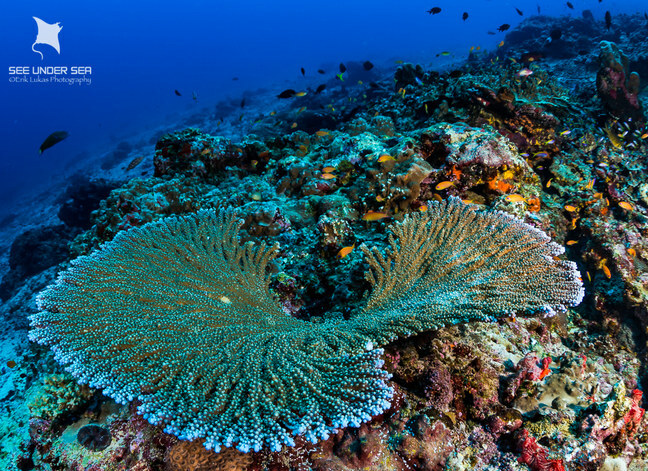 While coral is rather scarce in the shallower areas, the reef’s deeper edges are festooned with orange fan corals, pink soft corals, and large barrel sponges. Passing schools of fusiliers complemented the scene, providing some great wide-angle photo ops. For those who were more macro-inclined, there were plenty of colorful reef fish, including highly photogenic palette surgeonfish, regal and emperor angelfish, and a newly discovered dottyback species. 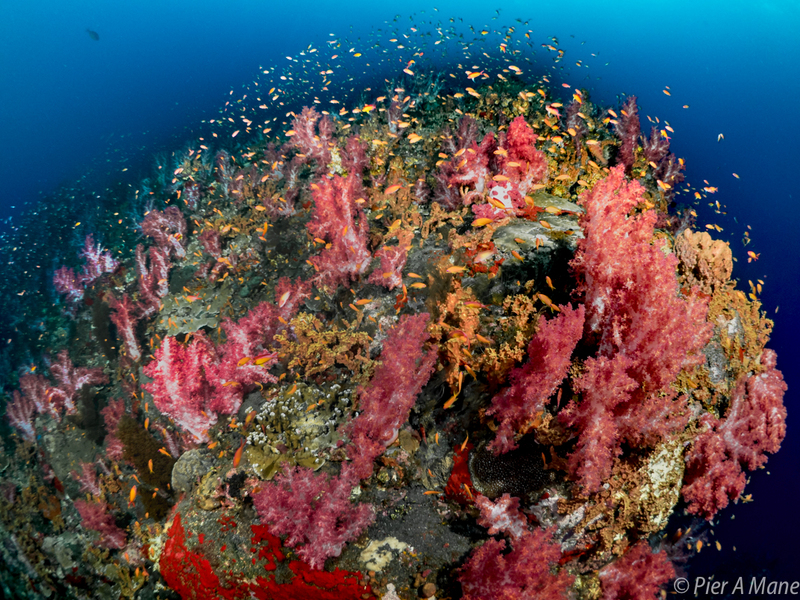 The next site, Ooh La La, was even more visually compelling, consisting of a rocky point that becomes a steep slope below the surface, most of which is covered with huge fans, clusters of barrel sponges and lush growths of soft coral. Visibility was excellent, providing once again for great wide-angle photo conditions. For those taking time to look a bit closer, however, there were also notable macro critters, including a pair of tiny green bubble snails that made us long for our macro lenses. After lunch we returned to HQ, where the current had picked up considerably. While the vigorous flow did limit the amount of ground we could cover, it also brought considerable rewards in terms of increased fish activity as well as soft corals inflated to their full glory. 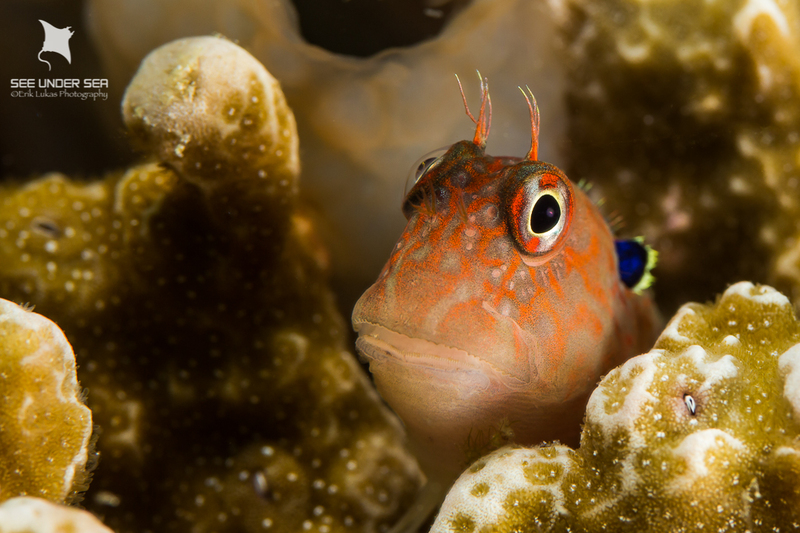 A few hours later we capped off the day with a night dive in easy conditions in the bay where we were anchored, where a wide variety of reef fish had tucked themselves among the rocks, and hundreds of shrimp eyes caught the beam of our lights. 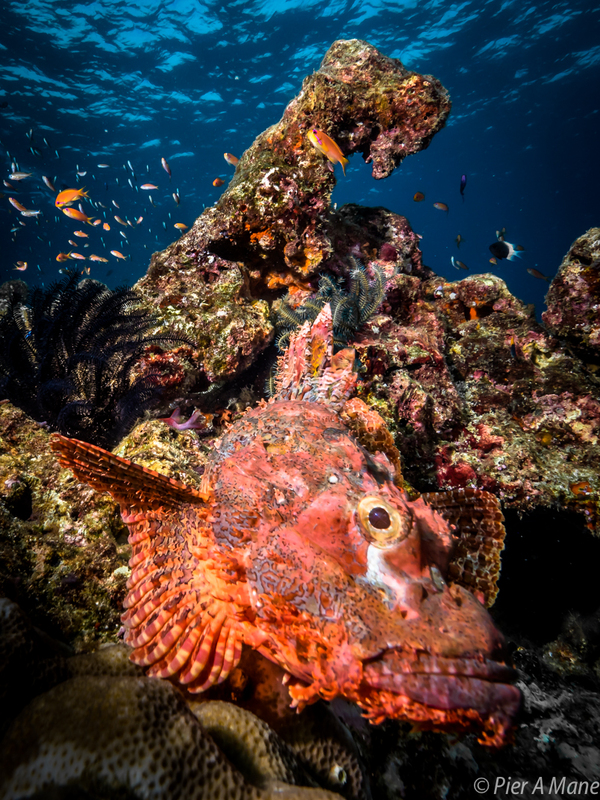 The next morning began with a return to the incredibly colorful Ooh La La, followed by two dives on another exceptionally vibrant and fishy site called Lighthouse Reef. 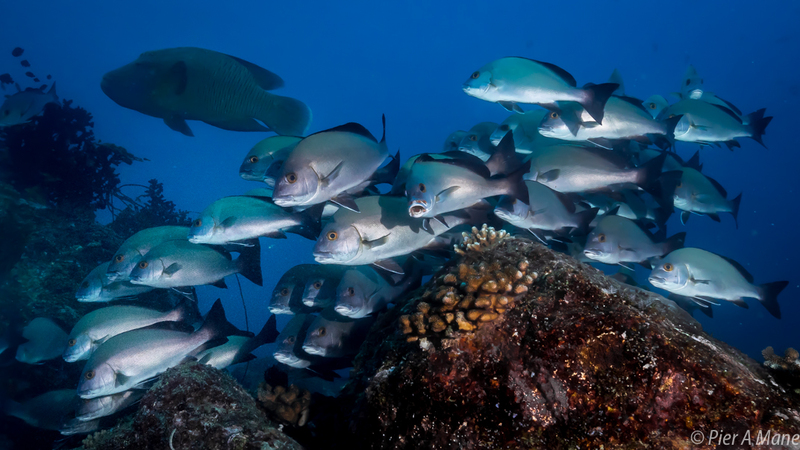 Here, a pair of rocky ridges protrude from shore into great depths, populated by abundant soft corals, sponges and fans, along with schooling bannerfish, as well as longnose, pyramid and white-collar butterflyfish. Bigger fish were also visible in the distance, including several Napoleon wrasse and brilliantly colored lunar-tail grouper. Even our blue-water safety stops featured great marine life, as we were circled by a pair of wahoo on two consecutive dives, along with passing schools of rainbow runners and giant trevallies. Our last dive of the day was another amazing site off Narcondam’s south end known as Chimneys, consisting of several rocky spires rising within 20 feet of the surface. 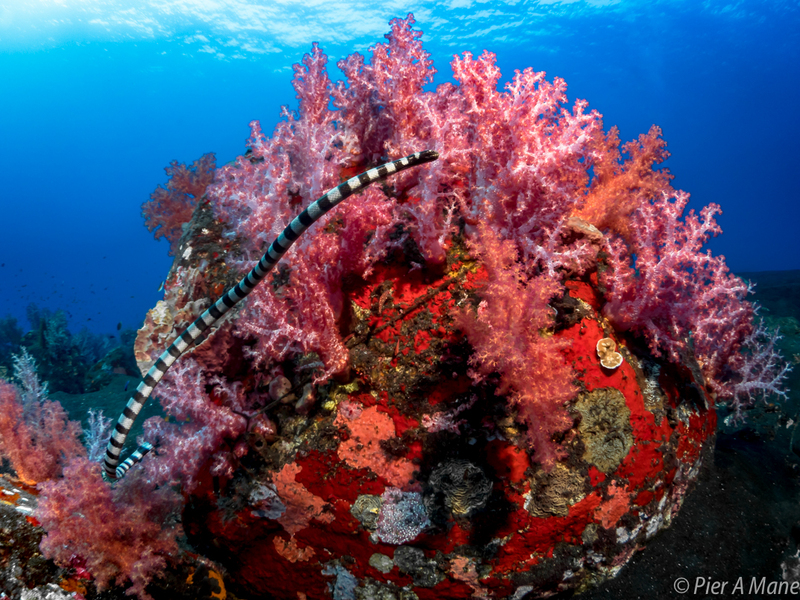 These pinnacles are nearly covered by pink soft corals, complimented by large fans and sponges around their bases. 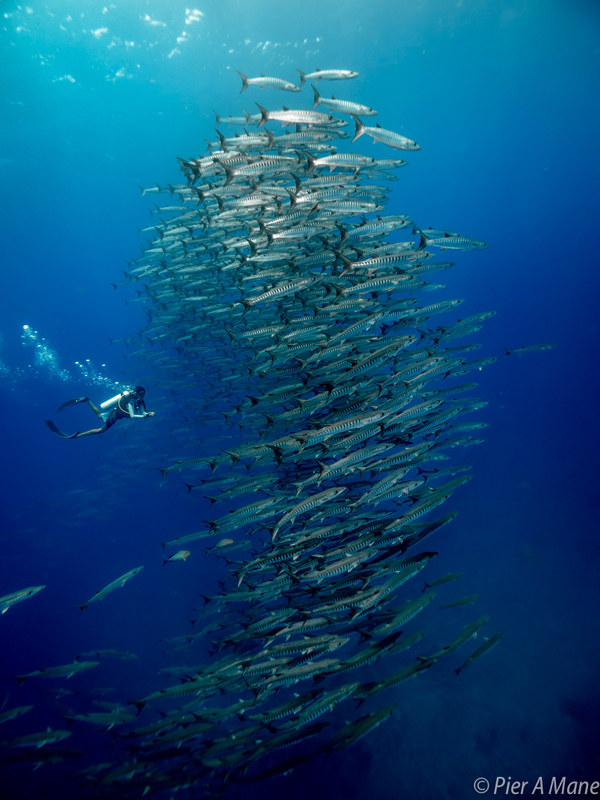 And, as you’d expect with such dramatic terrain, there were plenty of reef fish as well as schooling fusiliers and jacks. 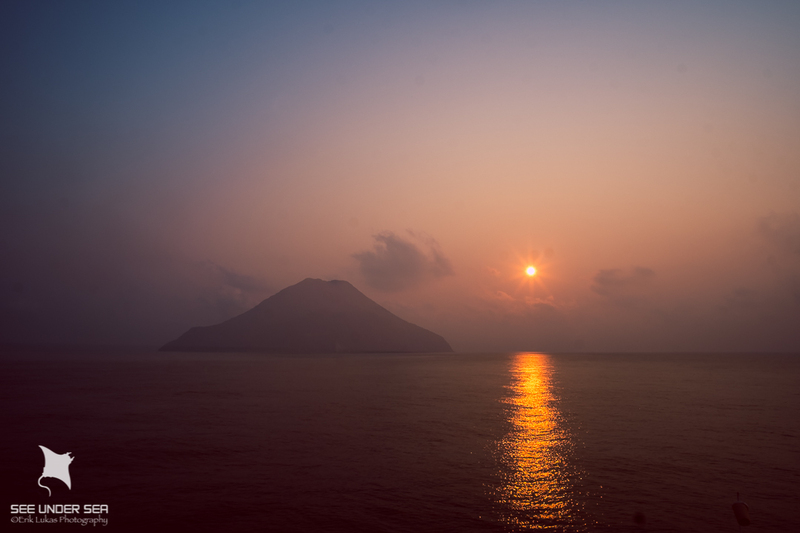 Our last three days were spent at the legendary Barren Island, another isolated location that is the only active volcano in all of South Asia, and home to some stunningly beautiful reefs. Initially we dived a pair of steep drop-offs at the base of the island’s prominent lava flow, where sections of vertical wall are punctuated with layers of overhanging ledges, and populated by impressive gorgonian fans. Most of the fish at these sites were small reef species, aside from a manta, which greeted us at the surface as well as at depth. Even the dinghy ride proved interesting here, as a white-breasted sea eagle crossed our bow carrying its prey, a banded sea snake. 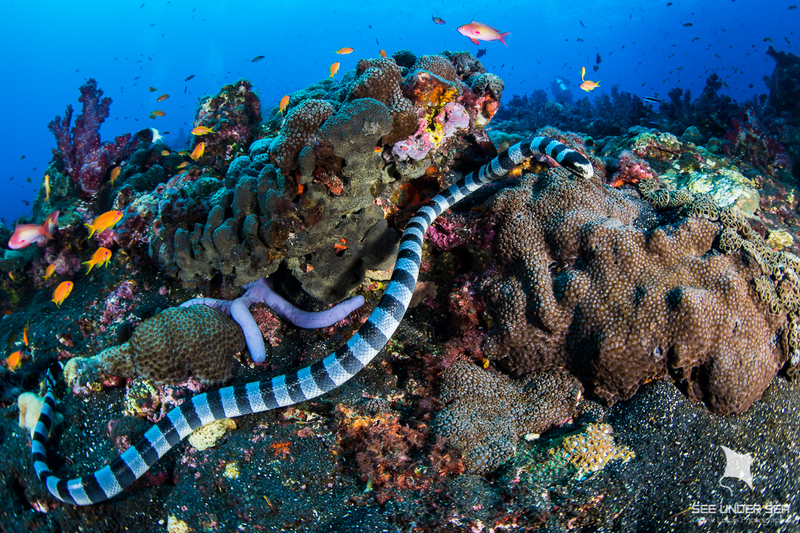 Properly known as sea kraits, these mild-mannered relatives of the cobra are quite common in the Andamans, with many dives including multiple encounters. That afternoon, we returned to the lava flow, this time motoring into a mini-fiord extending several hundred meters into the shoreline. Underwater, the outer edges offered a view of a steep boulder-strewn drop-off, where mantas make regular appearances. The main attraction, however, is in the shallows, where a huge garden of pristine hard coral thrives where molten lava flowed as recently as 1995. 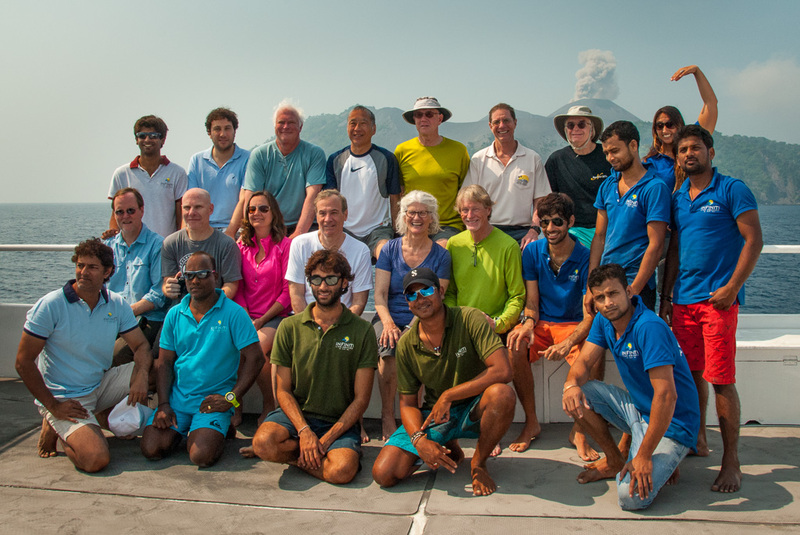 The easy conditions allowed for a long, leisurely dive, but for many the best part was yet to come, as we watched the volcano launch several successive plumes of smoke and ash. And, for those who weren’t busy capturing images of the event, there was even a natural geothermal hot tub... not a bad way to relax after a dive! The following day we moved around to the island’s northeast corner to dive two of my favorite sites in the world—Purple Haze and Black Magic. At the former, a series of parallel ridges extend from the rocky shoreline, quickly tumbling into nearly bottomless depths. 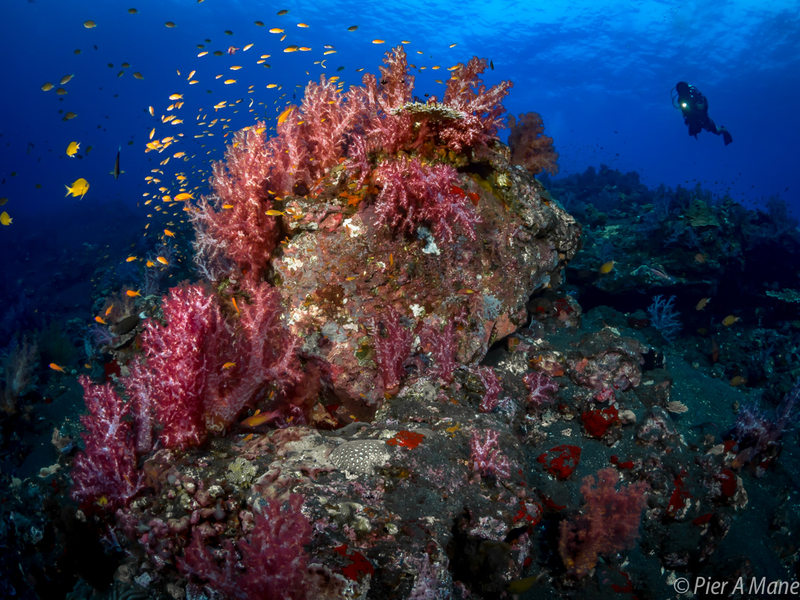 Starting around 60 ft., the slopes are covered with a forest of pink soft corals, accented by red and yellow encrusting sponge and occasional orange fans. Periodically, gangs of bluefin trevally swoop down from above, as clouds of nervous anthias dive for cover. In photographic terms, the place cries out for wide-angle, but it’s also great for fish portraits, including brilliantly hued decorated dartfish, regal angelfish and palette surgeonfish, among many others. 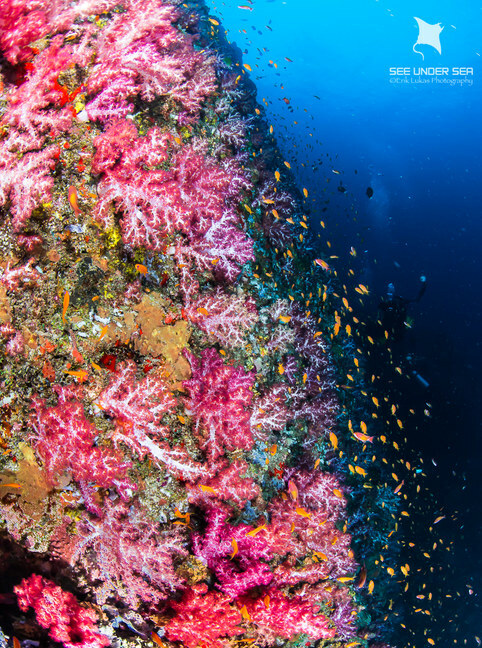 It’s also an ideal multi-level dive, with lively fish action and interesting terrain at safety-stop depth, including two sizable caverns that extend well above the waterline. Just to the west is the equally amazing site, Black magic. As the name implies, the bottom here is black volcanic sand, further enhancing the vivid colors of the soft corals and encrusting sponges that cover most of the T-shaped reef. 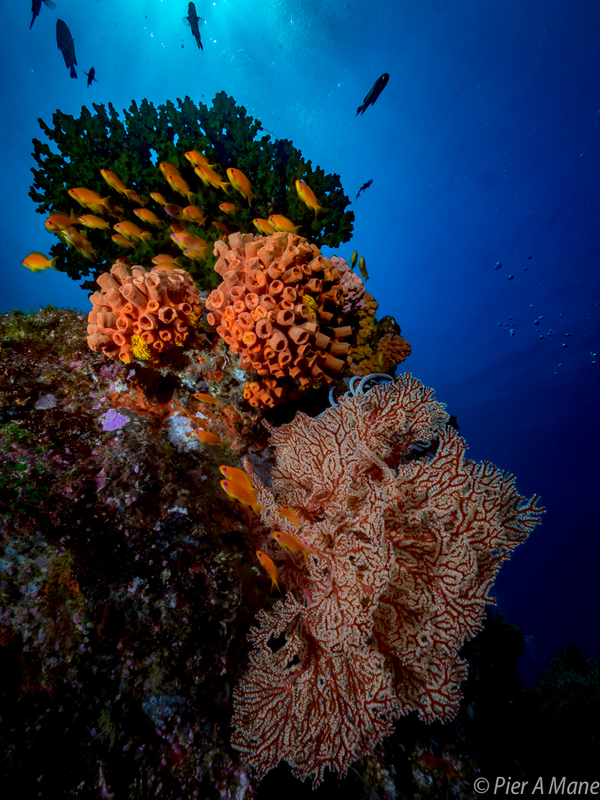 Along the deeper edges, large black corals and gorgonians compliment the scene, along with a wide range of fish life. At any time, a huge school of bigeye trevally may appear overhead, sometimes accompanied by chevron barracudas. Macro shooters also found some compelling subjects here, including colorful flag-tail gobies and Randall’s shrimp. Another great multi-level site, there is plenty to see in the shallows as well, including zebra dartfish, Midas blennies, as well as sand divers, which put on a spectacular show as the males flair their fins to show off to the females. 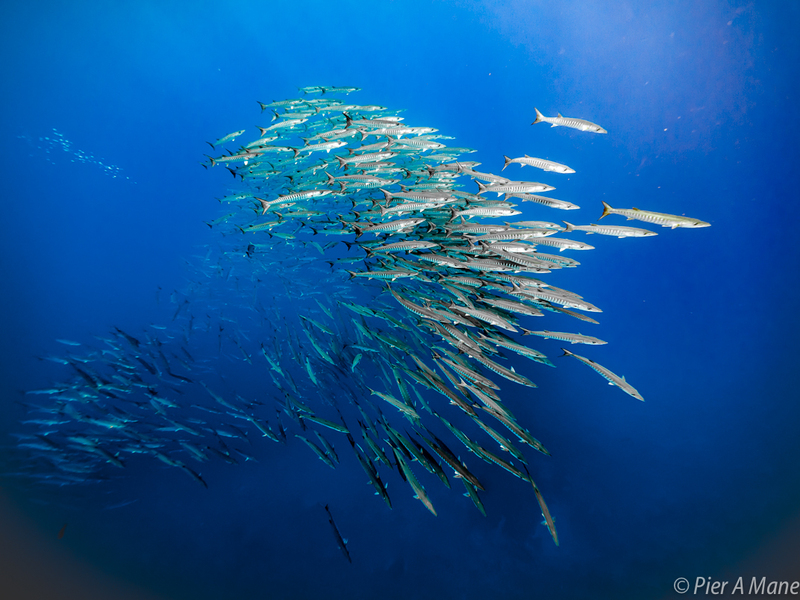 We also saw schools of milkfish—large, silvery relatives of the tarpon, foraging in the shallows on nearly every dive. Our final day was spent once again alternating between Black Magic and Purple Haze, both of which offered superb diving. As if that weren’t enough, dozens of spinner dolphins showed up as we drifted in open water between dives, entertaining us all as they cavorted around the boat. All too soon it was time to get underway to Port Blair, but not without a final pass by the lava flow. 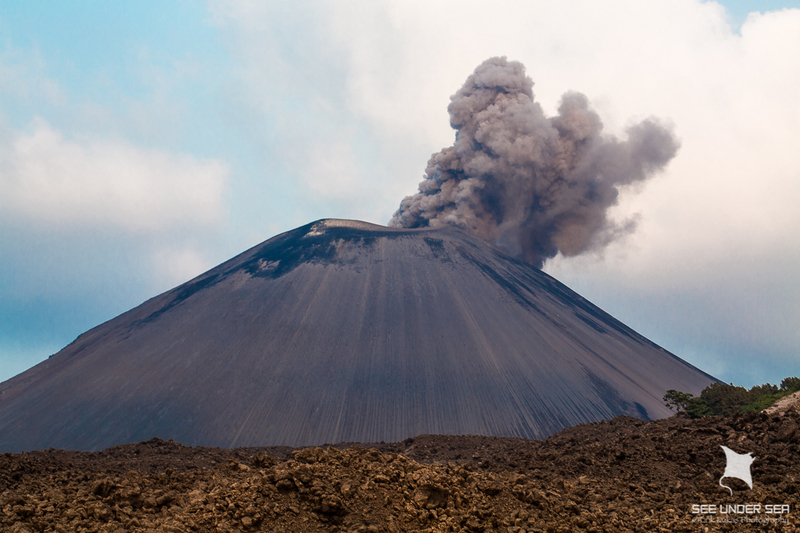 As if to bid us farewell, the iconic cinder cone issued several exceptionally robust clouds of smoke and ash… capping off a trip that none of us will soon forget. Smiling faces at the end of a wonderful trip. 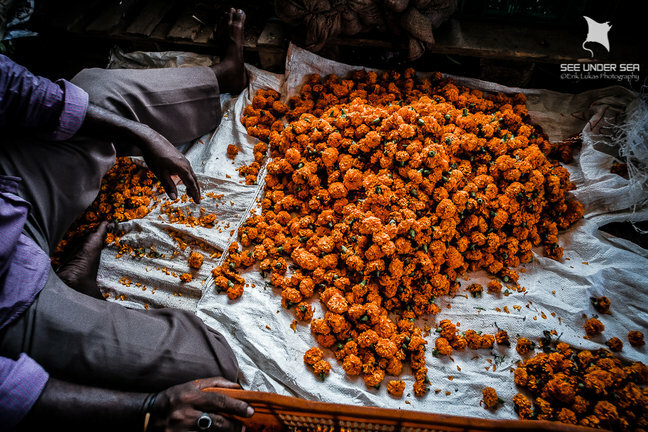 Bluewater Travel has experience booking personal adventures and leading group trips to the Andaman Islands. 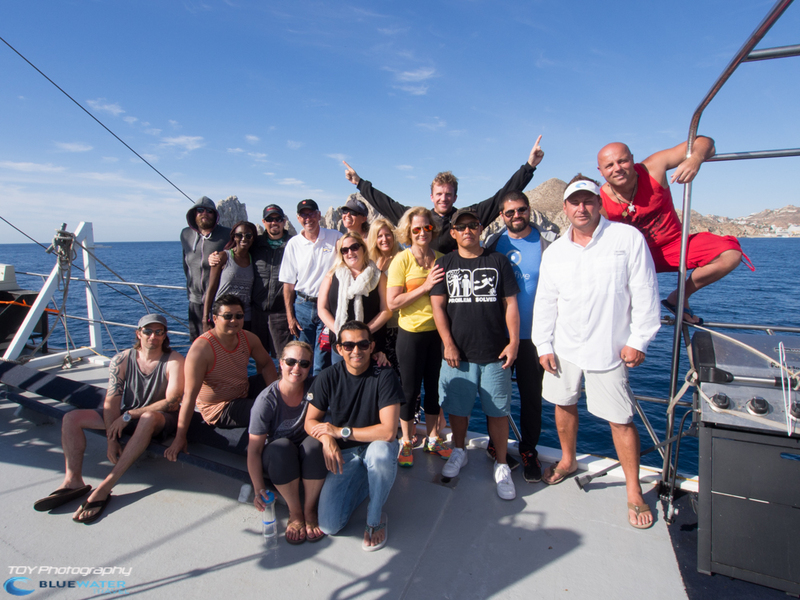 We can book you on the Infiniti liveaboard for the same cost or less than booking any other way. We know the diving, accommodation, cabins and when to go better than anyone else! 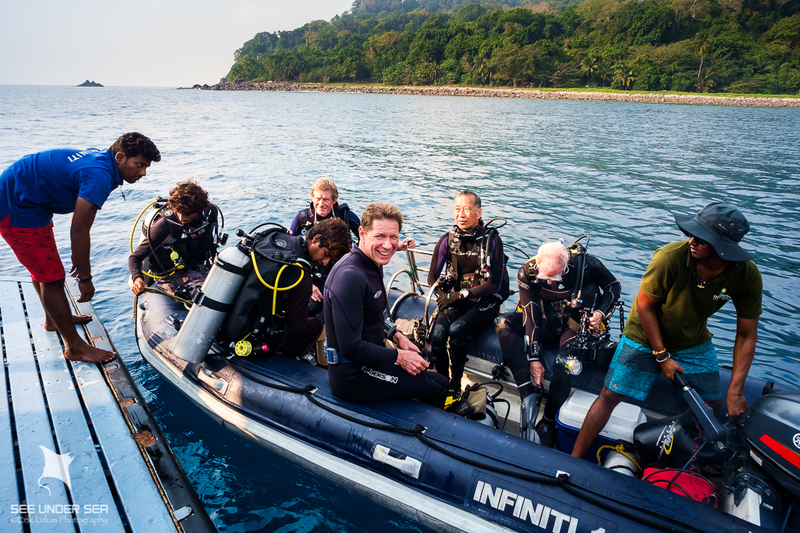 Email us at info@bluewaterdivetravel.com and tell us that you read this article to get $100 off your next personal dive trip to the Andaman Islands.